The Appliance Nerd - info and advice about dishwashers, washing machines, refrigerators...: Things people say: "My washing machine doesn't use enough water!" Things people say: "My washing machine doesn't use enough water!" Today's washing machines are water- and energy-efficient, quiet, with greater capacities and better cleaning power than ever before. Yet, there's a common, though not prevalent, refrain: "they don't use enough water!" Well, before I get into why they do, I'll get into why the old machines used so much. To make sense of this, let's go back in time about a century. 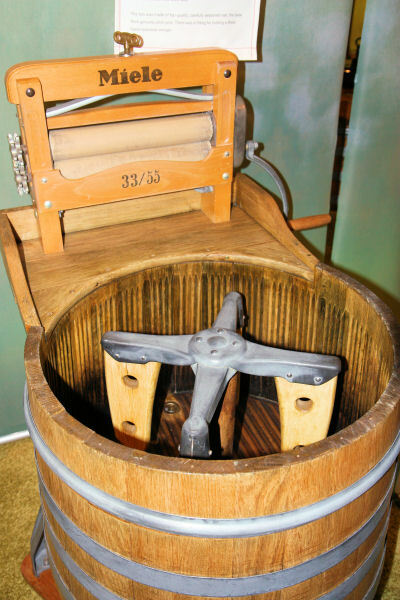 The earliest washing machines would beat up laundry swimming in soapy water. More vigorous and damaging wash motions yielded more cleaning, but it wasn't a very good long-term solution for keeping clothes for a long time (sock darning and sewing were far more widespread skills back then). How did you know your clothes were getting clean? Mostly by how violently the machine battered your laundry. And, for the next 90+ years, this would remain the primary method of cleaning. Soap flakes were used back then, containing ingredients like lye and naphtha. Washing machine or torture device? You decide. Now, let's go back about half a century. Imagine you're a laundry soap manufacturer. You've been selling soap flakes for years, and they leave behind a greasy film on top of the water. You develop a better-cleaning detergent using surfactants and enzymes. It sells well, but you want to sell more. If people thought your detergent was working extra-hard to clean, they'd buy more, right? Of course! Now, how can we create that impression? Well, when we wash our hands, we get suds. So, let's add a sudsing agent to the detergent. That way, when people look in on their laundry, they'll see lots of suds, and that will show them just what a good job the detergent is doing on their dirty clothes! So, between the old machines with their "beat 'em up" method of cleaning clothes in a tub full of water, and newer detergents that created lots of suds that would need diluting and lots of rinsing, water requirements became enormous. At the height of their consumption, recent conventional top-load automatic washing machines could use as much as 60 gallons of water. The detergents were better at cleaning, but they still needed lots of water to prevent excessive suds, and they needed lots of water to rinse those suds out. Now, let's look at today's high-efficiency washing machines. With greatly reduced water usage during the wash cycle, a high-efficiency detergent becomes necessary. Why? Air. There's much more air available in the tub that can result in soap bubbles. That means that a sudsy soap will result in lots of suds. So much, in fact, that the suds can overflow the washbasket and cause damage to the motor, bearings, and/or electronic controls. So, HE detergent is nothing more than a non-sudsing version of the detergents we're used to. But, efficiency aside, doesn't a washing machine need lots of water to clean effectively? Nope! A washing machine needs only a few things: enough water to soak the laundry, enough detergent to work on the dirt and take it away (but not too much), and mechanical action to create scrubbing action among the articles of laundry. Just like you wouldn't get a bucket of soapy water and slosh it around with a stick to wash a single item, your HE washer doesn't need tons of water to get the job done, either. The clothes will scrub each other clean in a concentrated mix of detergent and water, just like you would do if you were hand-washing a single item. That scrubbing action, not gallons and gallons of water, is what gets your laundry clean. But, you don't have to believe me. Check out Consumer Reports. Look at the top three dozen machines. How many of them are HE, and how many are not? Today's HE washing machines, whether front-load or top-load, are going to be much gentler while using far less water and energy, and clean even better than the old-fashioned machines. Heck, they even go so far as to say that front-loaders are the best cleaning washers on the market. They've got nothing to gain by saying they work better. Why do people say they need more water, then? Sometimes, it's because it's unfamiliar, and that creates confusion and disappointment. Other times, it's misuse, leading to poor results. And, sometimes it's just good ol' "I know what I'm doing!" but ignoring the instructions. Now, on rare occasions, it's actually the machine, but the vast majority of cases are caused by the user. Use the proper amount of detergent, follow the instructions, and your laundry will be cleaned properly. I promise!